It’s hard to believe that today (21st February) marks one year since Riverside guitarist Piotr Grudziński’s tragic and unexpected death from heart failure. As a fan, I still have difficulty hearing some of his beautifully expressive guitar solos (“Conceiving You” for instance) without tearing up. And I expect that is true of many Riverside fans. Especially today. Even after the life-changing year that 2016 was for Riverside, it’s fair to say that the final album with Grudziński, Eye of the Soundscape, is unique not only in the band’s history, but in the history of rock music itself. Never before has a major progressive-hard-rock-metal artist taken the bold artistic step of creating a double CD (3 LP) set of instrumental electronic adventures more musically analogous to such ambient artists as Aphex Twin or The Orb than, say, Rush or Dream Theater (the type of artists they’ve historically been compared with.) The seeming effortlessness with which the band is able to create a kind of music many would consider foreign to a “rock band” is indeed credit to their confidence, but the fact that it is at least as good as that of electronica’s leading proponents is testimony to Riverside’s brilliance. Sadly, all of that is overshadowed by the album’s heartbreaking back story. 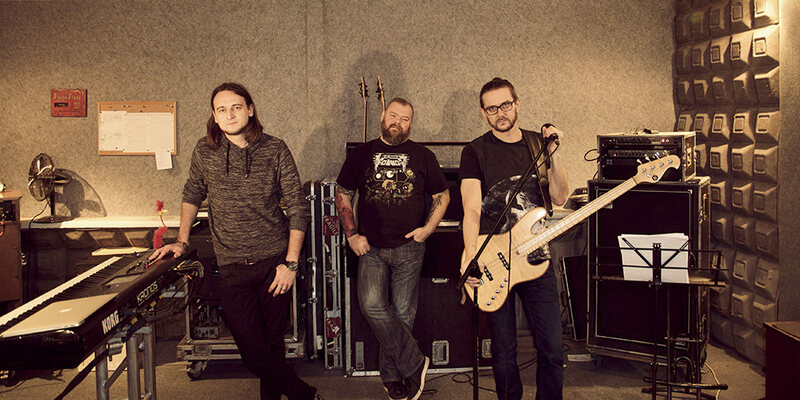 Though the band had experimented with their purely electronic side on the bonus discs of the deluxe versions of their last two studio albums (Shrine of New Generation Slaves and Love, Fear and the Time Machine), the intention when the four members of Riverside entered the studio last January was to record what bassist/vocalist/songwriter Mariusz Duda called “a fully fledged, independent release with that kind of music, full of space, trance, melodies and electronics.” As the sessions began, Grudziński (whose favorite band was gothic darkwave pioneers Dead Can Dance) told Mariusz that it had always been his dream for Riverside to record an ambient electronic album. And then, of course, the tragedy. On the morning of 21st February 2016, Piotr Grudziński died at the unthinkable age of 40. After the initial shock, Mariusz, keyboardist Michał Łapaj, and drummer Piotr Kozieradzki were determined to finish the project in tribute to their fallen brother, completing the album on what would have been Piotr’s 41st birthday. Given such circumstances, the results are not only a beautiful homage to their friend’s memory, but a bittersweet glimpse of a musician who was still growing, and was more versatile than even the band’s most ardent fans suspected. Grudziński’s heart-wrenching lyrical solo on “Rapid Eye Movement”, for example, is simultaneously an exhilarating musical journey and a sad reminder of what might have been, but when juxtaposed with the understated twangy fills of “Where the River Flows”, or the distinctly Cure-like “Shine”, it becomes clear that he was that rare breed of guitarist – one without musical boundaries. Much like the band itself. Combining new material with that which was originally on B-sides and bonus discs, the 100+ minutes of E.O.T.S. flows as if it were an ambient symphony, and as such, pays tribute to Grudziński’s spirit far better than any “greatest hits” compilation ever could have. It may not be a typical Riverside album, but it is an essential component in a complete understanding of what makes them such unique artists. A number of other projects that had been planned before the tragedy have also come to fruition. In September, the band’s previous (and most successful) album Love, Fear and the Time Machine was re-released in a Deluxe version featuring a 5.1 Surround Sound mix by producer extraordinaire Bruce Soord (of British progressive rock giants The Pineapple Thief) and the Riverside biography, High Resolution Dream (by Mauracy Nowakowski, but sadly yet to be translated into English) has been released to rave reviews. Though there was little doubt that Riverside would find a way to survive the events of this terrible year, it was still a great relief when two shows were announced that will take place later this week (on 25th and 26th February at the Progresja Club in Warsaw), dedicated to the memory of Piotr Grudziński. Both shows sold out immediately. Since then they have announced the Toward The Blue Horizon tour, which will cover much of Europe and conclude here in Kraków at Teatr Łażnia in Nowa Huta on 30th May. It will be quite an event. You should buy your tickets early. Obviously, these shows in Warsaw are a major event in the history of Riverside; a memorial to a lost friend, yes, but of equal importance, a declaration of survival, destiny, and new horizons. Personally, I only met Grudziński once – I interviewed he and Mariusz for the US magazine Progression literally the day after they had finished the final mix of Love, Fear and the Time Machine. I could sense the camaraderie between the two of them, and it was clear that they were justifiably excited about the masterpiece they had just finished. Later, when I declared it Album of the Year, Grudziński sent me a thank you message. Their show at Klub Studio was one of the greatest shows I’ve ever seen – and over the past 45 years, I’ve seen just about everyone you can imagine, from Zeppelin and Peter Gabriel-era Genesis to every Deep Purple lineup since 1972, to Springsteen, Nirvana, etc. My biggest regret is not getting a photo with Piotr after the interview. I thought of it as he and Mariusz were leaving, but decided it would be super-fanboy-nerdy-uncool to ask once they were already on the way out. ‘Plenty of time for that later,’ I thought. There’s a lesson in there somewhere. A few months ago, the legendary veteran Polish progressive rock band Collage – a band that was inspirational to Riverside as well as every progressive Polish musician of the 1990s – debuted their new lineup at the same Warsaw club. Any fears about whether the new members were worthy of the band’s fabled past were quickly allayed as they deftly mixed excellent renditions of old favorites with new material that is the equal of any in their catalogue. As Riverside prepare for this crucial next phase, take a moment today to listen to some of the glorious work they achieved with a young man who was not just a guitarist, but a complete musician who had that rarest of qualities – of being more concerned with what was best for the song than stroking his own ego. And if you’re lucky enough to be going to Warsaw this week, shed a tear for the past, but cheer loudest for the future. Absolutely fantastic article, I myself rank Piotr with the likes of a David Gilmour of Floyd. This article brought a tear to my eye I’ve been a fan for 11 years, America doesn’t know what they’re missing, most American music is crap anyway these days. Riverside to me anyway is one of the most diverse bands I’ve ever heard & I’m 60 years old & I’ve seen a lot of bands from any kind of genre but Riverside is one of my favs!! Mr.Duda should definitely have more notoriety than he gets hopefully they’ll rebound & get that big break much like Rush did many years ago. Your article has healed my heart in some way. You said many things I was thinking also. Like Conceiving you or the Curtain Falls. When I connect to a band’s music, I connect with each one of them. It still is a sad sad feeling when I listen to certain songs. But felt such positive feeling from reading your article. Thank you for it.